Fish. 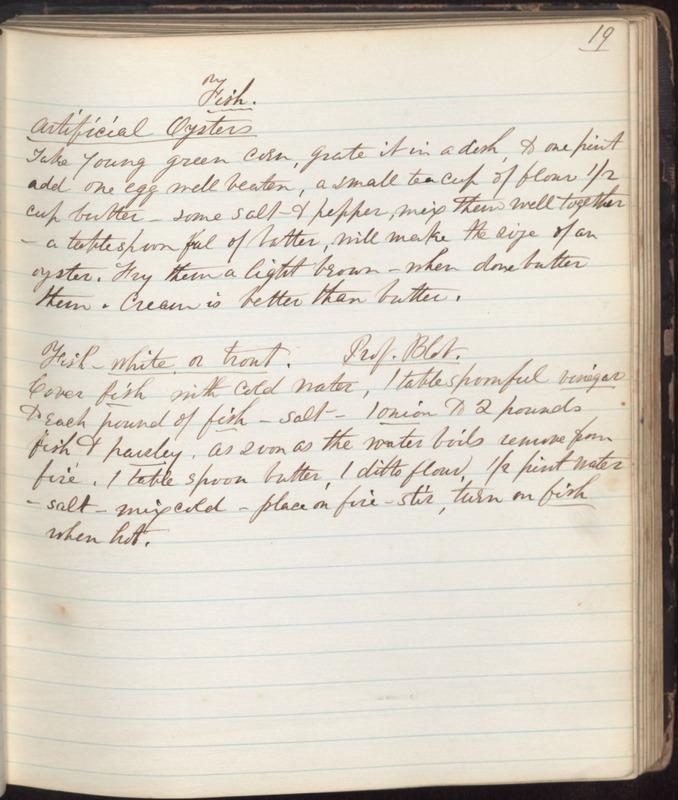 Artificial Oysters Take young green corn, grate it in a dish, to one pint add one egg well beaten, a small teacup of flour 1/2 cup butter - some salt & pepper, mix them well together - a tablespooon full of batter, will make the size of an oyster. Fry them a light brown - when done butter them. Cream is better than butter. Fish - white or trout. Prof. Blot. Cover fish with cold water, 1 tablespoon vinegar to each pound of fish - salt - 1 onion to 2 pounds fish & parsley. As soon as the water boils remove from fire. 1 table spoon butter, 1 ditto flour, 1/2 pint water - salt - mix cold - place in fire - stir, turn on fish when hot.